Dinosaucers was a short lived but fondly remembered Animal Superheroes cartoon from the United States that lasted only one season. (A particularly long season that was about 65 episodes, all of which ran in syndication for a while, but one season none the less.) 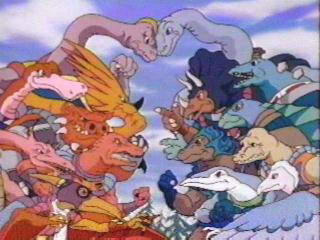 It is about a war carried out on Earth between two groups of anthropomorphic dinosaurs from outer space. The good Dinosaurs are the titular Dinosaucers who fight a group of evil dinosaurs, the Tyrannos. The Dinosaucers have also recruited a bunch of earth kids called the Secret Scouts to help them in their fight. Why? It was the 80's! Every show had kids being recruited to fight some kind of evil. The Dinosaucers also have an underused power called Dinovolving, which transforms them into normal, non-anthro dinosaurs while retaining all their other human-like abilities (talking, ect.) However it's rarely used and usually didn't appear for entire episodes. The Tyrannos themselves do not have this ability, but they do have a Transformation Ray gun that does essentially the same thing -- but the now-normal animal character has that animal's intelligence as well. The device is usually used on the Tyrannos themselves for comedic effect. Allo: An Allosaurus who led the group. Dimetro: A Dimetrodon (though he looks more like an 80's Spinosaurus, see below) who was the group's mechanic/scientist. Had a slight Scottish accent. Bronto Thunder: An Apatosaurus... or Brontosaurus. That name is always confusing for writers it seems. Was considered second in command. Stego: A Stegosaurus who was easily frightened and prone to panic attacks. Somehow he is able to stick his head inside his armor like a turtle. Don't ask how. Tricero: A Triceratops who used to be a detective back on the Dinosaucer's home planet, Reptilon. Talks in a voice that can be considered a slight parody of film noir detectives. Bonehead: Allo's nephew who was very stupid. For some reason, while his uncle is an Allosaurus he is a Pachycephalosaurus... yeah. Ichy: Pronounced 'Icky'. He's an Ichthyosaurus, a prehistoric marine reptile. He can swim very fast and communicate with other sea animals. For some reason, this sounds familiar. Teryx: The only female of the group. She's an Archaeopteryx who apparently can speak to birds. She has a crush on Ichy, but is afraid the relationship won't work because, well, she's a flyer and he's a swimmer. Ryan and Sarah Spencer: They're brother and sister, but he doesn't get into as much trouble as his sister does (although a lot of it is more getting into adventures rather than Damsel in Distress, thankfully), so he doesn't show up as much. Paul: An African American with glasses, appears to be a computer whiz. David: The tough guy of the scouts. Well, as tough as you can be while fighting dinosaurs from space, of course. Genghis Rex: The leader of the Tyrannos. Although why it's not entirely certain, as he's usually a perpetual failure. He's, of course, a Tyrannosaurus Rex. Ankylo: An Ankylosaurus, although with how much he snorts one would think he's a pig. Quackpot: A Hadrosaurus, with sharp fangs at the end of his bill, who acts the comic relief of the Tyrannos. He keeps making quack noises when he talks. Brachio: The Brute strongman of the Tyrannos. He's a Brachiosaurus. Styraco: A Styracosaurus who use to be a dentist(!!!) before joining Rex. Plesio: A Plesiosaurus who acts as an Evil Counterpart to Ichy. Terrible Dactyl: An English accented Pteranodon who wears a pilot's helmet and a white scarf. Acts as a scout for the Tyrannos. Came very close to making a genuine Heel Face Turn after a Crowning Moment of Heartwarming but, sadly, Status Quo Is God. The entire show's premise may be ridiculous, but hey... it's dinosaurs. Compare/contrast the genuinely ridiculous Extreme Dinosaurs and Dino Squad. All Planets Are Earthlike: Reptilon, which is also exactly on the opposite side of the Sun from Earth. And they speak perfect English off the bat. Authority Equals Asskicking: Rex and Allo tend to be the most competent in their respective teams, but this is taken to an extreme with the Dinosorceror and his wife, the Dinosorceress. An attempt to assassinate them with Frickin' Laser Beams simply resulted in the Dinosorceress catching them and asking the shooters if they wanted it back. They wisely declined. Barefoot Cartoon Animals: Several of the dinos. Berserk Button: Don't call Rex "Chiefasaur." Big Fancy House: Allo's home on Reptilon. That's where he keeps his wife, Vera, his daughter Allouette, and his hired help who is rather literally named Gator Maid. Card-Carrying Villain: The Tyrannos, especially Genghis Rex and Princess Dei. Cartoon Creature: Furballs, small, round, big-footed creatures native to Reptilon. The Chick: Teryx and Sarah fill these roles for both the Dinosaucers and Secret Scouts respectively. They do appear regularly in the series, although how effective they are depends on the plot. The Smurfette Principle: Related to the above trope, as this show's target demographic is for boys. Boys usually like Dinosaurs more anyway. Teryx and Sarah are the only main female characters on the show. At the same time though, as mentioned above, Teryx and Sarah do go on adventures with the team and do help beat the bad guys time to time. So they're not just there for eye candy. Christmas Episode/You Mean "Xmas": Three words. "Merry Dinosaur Day." Color Coded for Your Convenience: All the good guys had a blue color scheme. All the bad guys had a red color scheme. Cool Starship: All of the Dinosaucers and Tyrannos have their own personal ship (excepting Teryx and Terrible Dactyl, of course) which echoes their species, as well as both groups having an even LARGER starship they used to arrive on Earth. The Secret Scouts were also given high-tech transport vehicles of their own modeled after a motorcycle (Ryan and Paul), an ATV (Sarah), and a surfboard (David). Department of Redundancy Department: "Bronto" means "thunder" in Ancient Greek. So Bronto Thunder's name translates to "Thunder Thunder." Depraved Kids' Show Host: Quackpot of all people. He used to have his own kids show and was known as T.B. Duckbill. Enemy Mine: Done in one episode when Earth was invaded by pirate Sabre Tooth Tigers. The Tyrannos and Dinosaucers both teamed up to stop them, for the Dinosaucers it was because the Sabre Tooths were evil and for the Tyrannos it was because Genghis Rex didn't want them to steal Earth from him. "Everybody Laughs" Ending: Used sooo many times. Everything's Better with Dinosaurs: The whole concept this show is based on. Evil Counterpart: All of the Tyrannos, who were evil counterparts to the Dinosaucers. Film Noir: Several Tricero-centric plotlines are influenced by this, since he used to be a detective back on Reptilon. Goggles Do Nothing: Terrible Dactyl never takes his pilot goggles off! The same usually goes for Dinosaucers/Tyrannos that wear helmets. Harmless Villain: Most of the Tyrannos. They rarely get around to doing anything really evil, and even when they try to they mess up. Some of them (Terrible Dactyl and Plesio) are also known to show non-evil behavior, and at times they play games with the Dinosaucers. In fact,in one episode Quackpot is allowed to babysit one of Bonehead's relations. Hurricane of Puns: Oh dear sweet god the puns. The Dinosaucers and Tyrannos use them so much its ridiculous. Even the episode titles are just essentially puns! Hypno Ray: One of the many uses of Quackpot's "joy buzzer". Hypnotize the Princess: Sarah is hypnotized by Quackpot's joy buzzer so she will help him in a magic show. Interspecies Romance: Teryx is in love with Ichy, but she's reluctant to tell him because they're different species. She's an Archaeopteryx, he's a Ichthyosaurus. Of course her reasoning is a little strange considering that it appears that interspecies relations are rather common on the Dinosaucers' home planet (leading to some... interesting Fridge Logic) and Ichy has no problem getting around on land anyway. Its never really made clear if Ichy and Teryx ever do go out with one another. There's some strong hints that after "For the Love of Teryx" they do. Mostly knowing looks and rather heartfelt farewells from time to time when they separate. The mind can't help but wonder what would have happened had the series gone on longer. Would their kids have been Marigryphs? At least one episode references the fact that Teryx and Genghis Rex used to actively date one another at some point back on Reptilon. She didn't seem to have any problem with the idea back then. Thing is, he still carries a torch for her, but Teryx has long since moved on. With Ichty it's probably more of an "air versus underwater" thing than the species thing. A Little Something We Call "Rock and Roll": Subverted when David tried to teach the Dinosaucers about music; the Dinosaucers found the sound incredibly painful on the ears, and when they had to stand in for David's band later, they naturally couldn't play a lick of good music. Lovely Assistant: Sarah, both willingly with the good guys, and when hypnotized by the bad guys. Magic Pants: Devolving simply makes the clothes disappear. They show up again once the victim returns to normal. Mirrored Confrontation Shot: Used in the opening credits, as seen in the page image. Neck Lift: Genghis Rex's usual method of asserting his authority among the Tyrannos on the rare occasions yelling didn't suffice. No Peripheral Vision: The Dinosaucers and Tyrannos are pretty stealthy... being as big as they are. No one ever seems to notice the giant prehistoric monsters sneaking behind them... ever. One Egregious example is when Sarah is looking from side to side in front of her while Ankylo and Quackpot sneak past behind her. Its rather ridiculous to see creatures almost twice the size of a regular human simply tip toe past people without being spotted. Opening Narration: Given by Ryan during the Title Sequence. Pink Means Feminine: Sarah's pink tights. Plucky Girl: Sarah is sweet and kind, but also pretty headstrong. Plucky Comic Relief: Primarily Stego and Bonehead, who is also the Tagalong Kid by virtue of being Allo's nephew. Product Placement: Averted Trope. The show itself was owned by the Coca-Cola Company (during the time when they ran Columbia Pictures)... and they didn't saturate it with in-show ads! It's now owned by Sony (Columbia's current parent company), for what it's worth. Additionally, the toy line was never released (aside from a a very small release overseas). This is pretty weird, as the molds were ready, which is why they were sold to another company to make the aforementioned overseas run; the cancellation was very sudden. Punch Clock Villain: The Tyrannos, for a group of insurgents, seem to be able to travel between Earth and Reptilon pretty easily. They go on breaks there when they are not busy being villains. Ring of Power: Played completely straight with the Secret Scouts' rings. They served as Comm Links, and when invoked with the phrase, "Secret Scouts ring, power up! ", the Scouts' natural athletic abilities would be enhanced for a short period of time. Ryu and Ken: An interesting take on the species of each Dinosaucer and their Tyranno counterpart. Selective Obliviousness: Those poor, gullible Tyrannos... For a point of reference, they heard about the Astro Dome housng the biggest "diamond" in Texas. Guess what kind of diamond they took that to mean. Sssssnaketalk: Plesio, though refreshingly, he's the only reptilian character to do so. Somewhere a Paleontologist Is Crying: There's a little leeway given that these are all aliens who happen to resemble anthropomorphic versions of Earth animals. Still, there are some weird things such as Quackpot's fangs and Terrible Dactyl's long tail. Further, the Dinosaucers and Tyrannos who aren't dinosaurs (but who end up being called as such in low-quality children's books), Dimetro, Terrible, Ichy, and Plesio, keep calling themselves dinosaurs. Dimetro is kind of an oddball there. Dimetrodons are most definitely not dinosaurs. They are pelycosaurs, the ancestors of the therapsids, who were in turn the ancestors of mammals (in short, Dimetro is a closer relative of the Secret Scouts than he is to any of the Dinosaucers). However, given Dimetro's appearance, it's very possible that the producers had Dimetrodon confused with Spinosaurus. Old illustrations of Spinosaurus basically show an animal that could easily be confused for a bipedal Dimetrodon (the only good specimen of Spinosaurus was destroyed during World War two -- really). Indeed, Dimetro's head resembles the head Spinosaurs were drawn with in the 1980's, long before Spinosaurus' relative Baryonyx was discovered and turned out to have a head that does not look like that of any other large theropod at all. Take a look at this old illustration from the time (there's even a direct comparison to Dimetrodon) for an example. When Dinosaucers was being created, the dinosaur formerly known as Brontosaurus had been renamed Apatosaurus, after paleontologists determined that the two species were the same and that Apatosaurus was the older, and more valid, name. However at the time Brontosaurus was still the name pop culture was familiar with, and so Dinosaucers continued to use it. This trope is Lampshaded when Bronto is told that Apatosaurus is the appropriate term for his species. On his planet it's apparently a girl's name. Specifically, "Apattysaurus" is the name of his girlfriend back home. Although Terrible Dactyl had teeth and a tail, which Pteranodon didn't, a more primitive pterodactyl called Rhamphorhynchus did. In fact, the animators of Dinosaucers were clearly inspired by Ramphorhynchus when designing Terrible Dactyl. Status Quo Is God: And how! Everything always reverts to the status quo at the end of the episode. Nothing ever changes. Like most cartoons of its time, the series doesn't follow any overarching storyline. Every episode was self contained. Ergo, there was no need to change anything. All the Tyrannos will always be evil even after betraying Rex, no characters ever die or leave, and the Dinosaucers and Tyrannos, despite meeting several humans not part of the main cast and even being involved in an actual court case at one time, always go back to fighting their battle in secret. Taken for Granite: The Fossilizer, a gun that turns Dinosaurs, people and objects into stone. Too Dumb to Live: Some of the Tyrannos come off as this sometimes. Quackpot takes the cake in one episode where he happens to notice that Genghis Rex is just a bit crazy.... then loudly proclaims an insult regarding Genghis Rex's mental state to the other Tyrannos. Good thing Rex wasen't in a "break your face open with my fist" kinda mood that day. Transformation Ray: The Devolving Gun. Reverts the victim to their prehistoric form and decreases their intelligence. Further explored in Dinovolving, a technology the Dinosaucers have and the Tyrannos want. Not only do they revert to their feral form, but they retain their intelligence and ability to speak. Unusually Uninteresting Sight: Ties into the Status Quo Is God thing above. Unwanted Rescue: In one particularly strange episode, Plesio does a jailbreak for the underwater inhabitants of an aquarium. He essentially offers them freedom from their "Human Slave Masters". While the sea creatures are initially swayed into thinking Plesio's form of freedom is right, they quickly become disillusioned. Mostly because they grow hungry, tired, they no longer think its very fun, and Plesio states that he hates mammals in general making the Dolphins abandon him. Plesio's plans to take back the seas from the humans only goes as far freeing a school of fish from the net of a fishing boat. Of course, the aquarium creatures were probably raised in captivity, but hearing one say "I don't think I like freedom" is kinda weird. Needless to say, the episode is like a reverse viewing of Captain Planet. Villain Ball: Genghis Rex is incredibly ineffectual as a villain. Not only do all his plans fail, they're never even very well thought out or clear. Name something from the Villain Ball page and Rex probably has it. Even the other Tyrannos don't seem to respect him all that much; some have betrayed him behind his back, while others just enjoy making fun of him. The episodes usually end with him suffering from a very embarrassing defeat. Villain Exit Stage Left: Done to ridiculous extremes! Allo always lets Rex and the Tyrannos get away. ALWAYS! Rex doesn't even have to retreat, he just has to walk off and no one bothers to try and chase after him. Its so bad at times, that one has to ask if this Alien Dinosaur battle for Earth is actually taken seriously by either the Tyrannos or the Dinosaucers. One rather memorable example had Genghis Rex offer to destroy his own base for the Dinosaucers (while under the effects of a sort of loyalty-switching ray). Of course, Allo refuses. Water Is Air: Ichy and Plesio have no qualms with speaking underwater when they need to. This page was last edited on 5 April 2016, at 00:28.